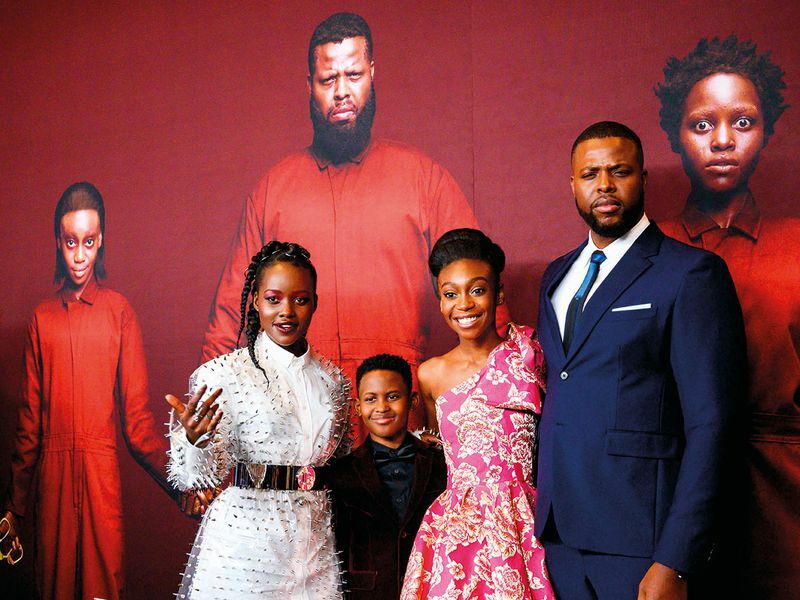 In one of the most terrifying moments of Jordan Peele’s latest horror thriller, ‘Us’, out now in the UAE, the Wilson family (played by Lupita Nyong’o, Winston Duke and young actors Shahadi Wright Joseph and Evan Alex) are confronted by their own menacing doppelgangers in the darkened living room of a Santa Cruz, California, vacation home. The sequence, which brings the Wilsons face to face with their seemingly nefarious counterparts — known as the Tethered — for the first time, required multiple days of shooting, four body doubles and occasional facial replacement. It would have been a daunting task for the most experienced veteran, let alone two budding stars under the age of 18. “That took about three days,” said Joseph during a press day at the London West Hollywood hotel following the film’s world premiere at the SXSW Film Festival. The 15-year-old plays eldest daughter Zora and her counterpart, Umbrae. After sending in a self-tape, Joseph was invited by Peele to come in for a formal audition. “I was like, ‘Oh my God, this is incredible,’” she said. Working with Oscar-winning actress Nyong’o, who plays the Wilson matriarch Adelaide and her shadow (dubbed Red in the film’s end credits) was as instrumental as working with Peele, Alex said. By contrast, Joseph got her start in musical theatre, appearing in 2016’s ‘Hairspray Live!’ and in the Broadway production of ‘The Lion King’ before nabbing the role of young Nala in Jon Favreau’s upcoming photorealistic animated remake (Beyonce voices her adult counterpart). “I like ‘Halloween’” said Alex, referring to last year’s sequel to the classic 1978 film. Joseph named 2014’s ‘The Babadook’ as her favourite horror movie. The two are also fans of Peele’s directorial feature debut, ‘Get Out,’ though are careful not to liken that film with this one. Instead, the film mostly sidesteps political and social commentary, focusing instead on the duality of the self and the finger-pointing that has intensified in the post-Trump era. Though Joseph has her own ideas about the film’s latent messages. Us is now showing across the UAE.